I wrote a post earlier about having hush puppies with my lunch today and forgot that many of you are in other parts of the country and may not be familiar. Gill asked what they were and I started thinking of others that may wonder as well. Of course there is also the popular shoe brand called Hushpuppies that some of you are familiar with. They are great comfortable shoes that have been around forever it seems. If you're eating a fried catfish or shrimp dinner at a seafood restaurant in the South (or, lately anywhere else in the country), usually it will be served with hushpuppies. 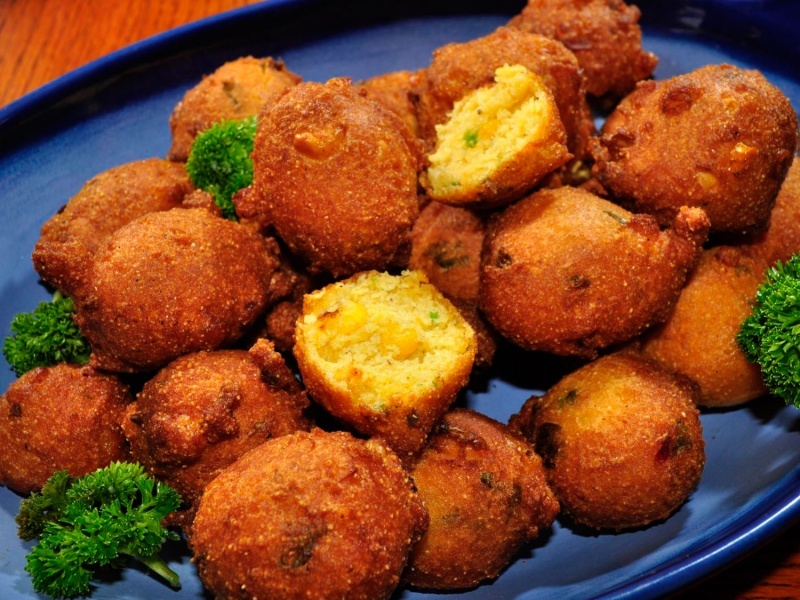 They are made from a cornmeal batter, dropped in balls into a deep fryer and cooked until crispy on the outside and soft and chewy in the middle. When I cook them at home, I fry them in a frying pan. They are delicious, but no one seems to have a clue where they came from. I have eaten these delicious little cornbread bites my entire life and have no idea where the name originated. Pixabay photo. Does anyone out there know where the name originated? Have you had this fried cornbread before? According to wikipedia... The name is often attributed to hunters, fishermen, or other cooks who would fry some basic cornmeal mixture (possibly that they had been bread-coating or battering their own food with) and feed it to their dogs to "hush the puppies" during cook-outs or fish-fries. Other legends date the term to the Civil War, in which Confederate soldiers are said to have tossed fried cornbread to quell the barks of their dogs. Yes, it's mostly served with seafood but can also be served with fried chicken at restaurants here in the South. Yes I read that, I wonder how true it really is. Who knows I just know I love eating them.. with anything. Thanks for the link. @CarolDM Your welcome. I mean, I assume it's true, but then it might not be. I usually end up eating them with seafood. I'll have regular cornbread with soups or ham and pintos. I dip my hushpuppies in tartar, honey mustard, ranch or ketchup. I know some who will soak them in buttermilk. @ScribbledAdNauseum Yes I dip mine too. Good stuff. Soaking them in buttermilk is what my Grandmother used to do. Love hush puppies!!! On fish Fridays I get hush puppies with my dinner!!! The ones I get have corn in them , at least twice a month!! Yes I love any kind of bread. And love the corn fritters too. Now I know what the term means. If I was to get a waitressing job in London and an American tourist asked me for hush puppies I would not offer him/her shoes. Yes, it is so cool to share word knowledge with my friends. As I visited the south of the United States many times, I know what hush puppies are, they are good with fried catfish. Someone told me that the name comes from the habit of hunters and fishermen to feed those fried balls to their dogs, to "hush the puppies" during cook-outs. I've tried them once, and didn't like them. But I'm a picky eater, and don't like cornbread itself, so I'm not surprised. I love just about anything fried. Not healthy but i like them in moderation. @CarolDM I love fried dough, and fried chicken. I had to read what this post was all about. What is she eating? It is an unusual name for what you describe. @db20747 I usually bought cheaper shoes. I tried to use my resources wisely and alway put the family first. @1hopefulman good man U R!!! I tried them once and that was enough for me. I'm not a cornmeal fan. Yes many of them have shut down, we have a few left here. @CarolDM That is neat that there is still some left there! I am one of those not familiar with it. Lol I only know it's my shoe brand. Yes we have the shoes here in the US as well. Now you know! @CarolDM yes, it's also a kind of food. Yeah, I had some just last week with my fish dinner. Ya gotta love hushpuppies! That is great, I do love them. i love them . had them most my life also. no idea where the name comes from. probably some southern lady from way back. Probably so, I love them too. I made them once and we loved them. Thanks for the explanation. I've wondered what they were before too. I haven't tried them. They look tasty. My husband makes delicious hushpuppies when he fries fish. When made right, they really are yummy. Oh that is great, they are so good. Luck you! This looks similar to some Indian sides. Oh really, that is cool to know. I've never had hushpuppies but they certainly look delicious. I can see from the picture that the food will be delicious. But i never heard of of the name, i will also have to make a research on that to know how it originated. I have only had them a few times when I went to Long John Silvers....they are okay to me. Don't know about the name though!